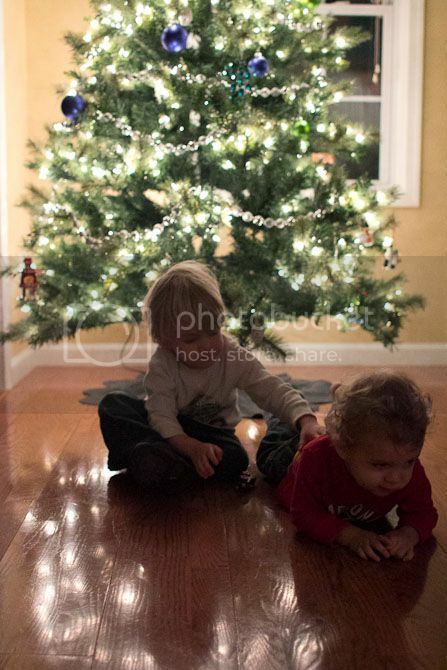 Remind me next year--pictures are easier to shoot when you decorate a tree before the sun sets. 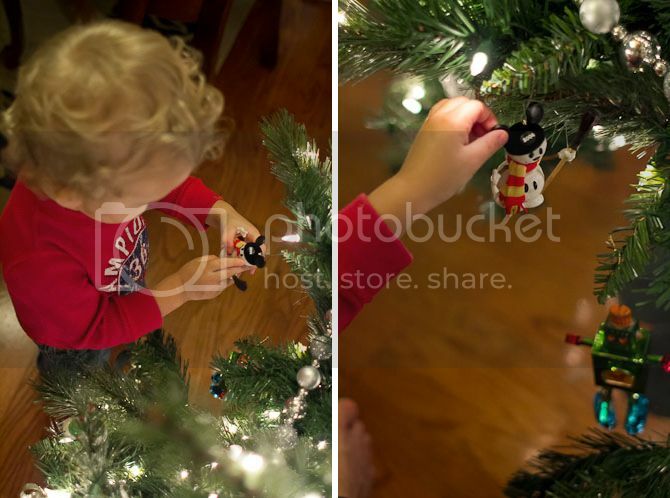 Everybody likes the snowman Mickey Mouse ornament! Braden has been very respectful of the tree--he's surprisingly completely disinterested in it. 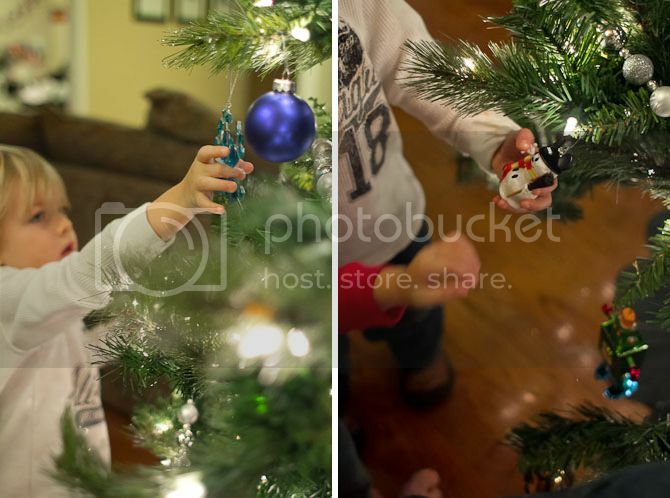 Both boys fight over a bell ornament whenever they remember about it--thanks Polar Express! 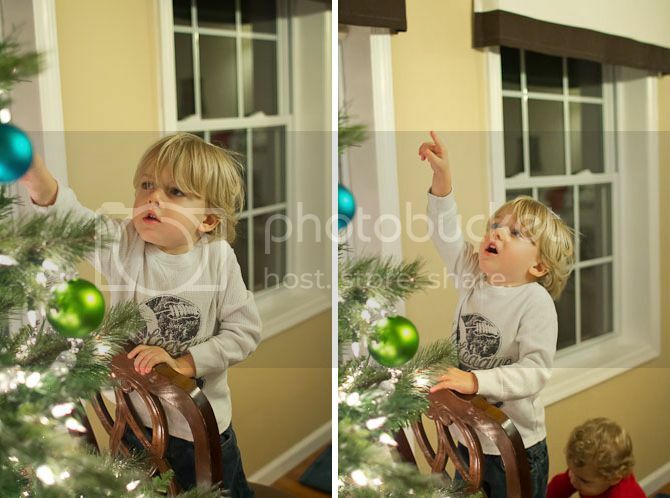 Finley was very excited about the star on the top of the tree--something he thinks is crucial to it being Christmas. That poor kid has a very confused idea of Christmas--some conglomerate of Polar Express, Jesus, snow and Santa. It's tough to be three. And here are those sweet boys last year... I can't believe how much bigger they are! I totally forgot about this fabulous and completely expected picture from our time in Louisville over Thanksgiving. Finley not smiling. 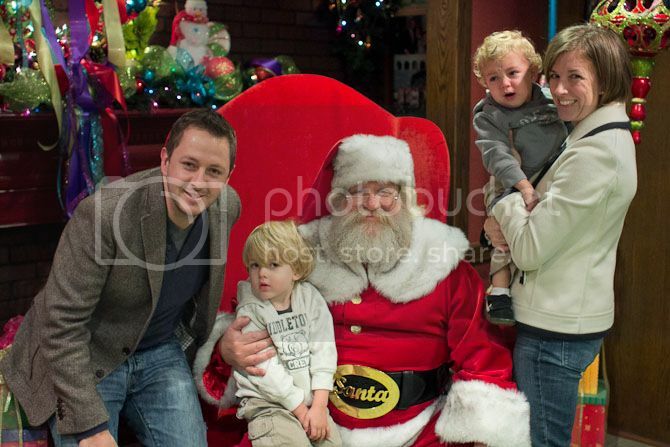 Braden screaming because he's sure he's going to get left with Santa forever. Typical. to me, Santa is saying with that smile, "Look Brady, I didn't want you to stay either." Seriously, what's the deal with the belt buckle? Hey old man, we know who you are. hi rachel -- loove your blog!! i stumbled here from pinterest by way of your "2011 pinterest christmas" post. i made the felt christmas tree for our little guy on friday :) anywho, i'm really diggin' how you've posted your side-by-side photos above. can you tell me how you do that? Photoshop! Bit you might be able to do it for free in Picasa, Gimp or Picmonkey!